Located in Centro, this hotel is steps from La Equitativa Building, Casino de Madrid, and San Fernando Royal Academy of Fine Arts. Church of las Calatravas and Real Casa de la Aduana are also within 5 minutes. Sevilla Station is only a 2-minute walk and Sol Station is 4 minutes. 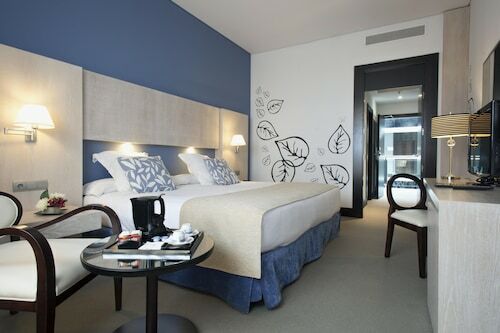 Located in San Blas-Canillejas, this hotel is 3.1 mi (5 km) from Estadio Wanda Metropolitano and within 9 mi (15 km) of IFEMA - Feria de Madrid and Thyssen-Bornemisza National Museum. El Retiro Park and Prado Museum are also within 12 mi (20 km). Alameda de Osuna Station is 23 minutes by foot. Located in Golden Triangle of Art, this hotel is steps from Lavapies, Museo Nacional Centro de Arte Reina Sofia, and CaixaForum Madrid. Paseo del Prado and Prado Museum are also within 10 minutes. 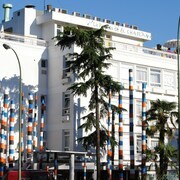 Estación del Arte is only a 2-minute walk and Anton Martin Station is 8 minutes. 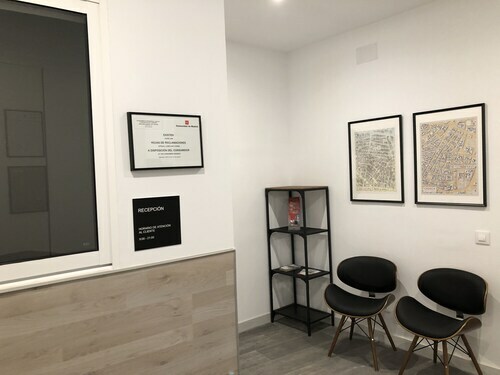 Located in Centro, this apartment building is within a 10-minute walk of Plaza de Callao, Plaza de España, and Plaza Mayor. Royal Palace and Plaza de Cibeles are also within 1 mi (2 km). Santo Domingo Station is only a 2-minute walk and Callao Station is 3 minutes. 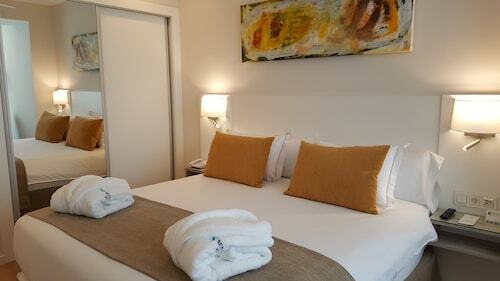 Puerta del Sol Rooms overlooks the square of the same name, at the heart of Madrid's legendary nightlife. 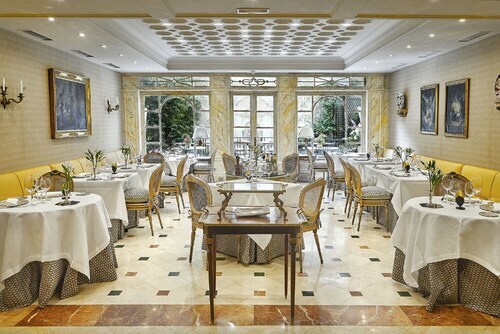 By day, guests can take in world-class art at the Prado, Thyssen, and Reina Sofia museums, all within a 10-minute walk of the hotel, or take a stroll in Retiro Park, a 5-minute cab ride away. 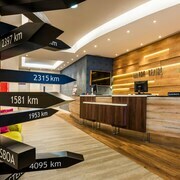 Located in Barajas, this hotel is 0.9 mi (1.4 km) from IFEMA and 2.3 mi (3.7 km) from Plenilunio Shopping Mall. IFEMA - Feria de Madrid is 2.8 mi (4.5 km) away. Barajas Station is 9 minutes by foot and Aeropuerto T1-T2-T3 Station is 16 minutes. 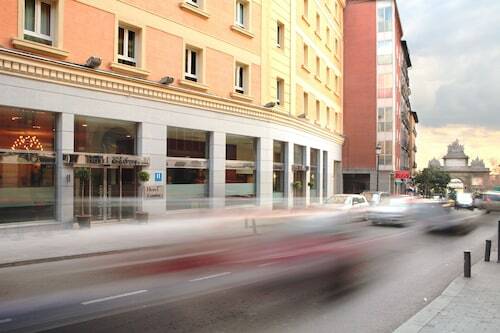 Located in Barajas, this romantic hotel is 1.1 mi (1.8 km) from IFEMA and 2.5 mi (4.1 km) from Plenilunio Shopping Mall. IFEMA - Feria de Madrid is 3 mi (4.9 km) away. Barajas Station is 7 minutes by foot and Aeropuerto T1-T2-T3 Station is 20 minutes. 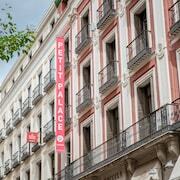 Located in Centro, this hostal is steps from Plaza de Espana - Princesa and Lope de Vega Theatre. Gran Via Street and Plaza de España are also within 5 minutes. Noviciado Station is only a 2-minute walk and Santo Domingo Station is 3 minutes. This 19th-century Belle Epoque hotel is in the Salamanca district, on a gallery-lined residential avenue opposite Orfila Art Gallery; Plaza de Colón is just steps away, as is the Museo Reina Sofía. 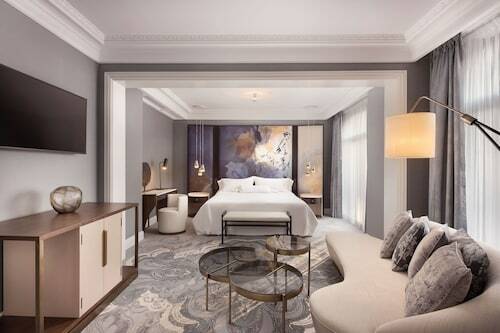 Built by King Alfonso XIII in 1910, this grandiose Madrid hotel is located opposite the Prado Museum and steps from the Thyssen-Bornemisza Museum, the Bourse stock exchange, and Retiro Park. 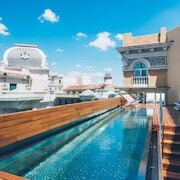 Overlooking the Neptune Fountain and its quiet plaza, this regal Madrid hotel lies opposite the Prado and Thyssen-Bornemisza museums and two blocks from the Reina Sofia Art Center. How Much is a Hotel Room in Madrid? 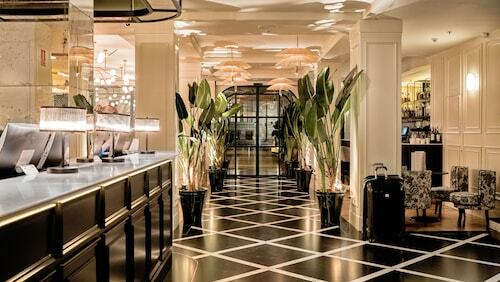 Hotels in Madrid start at C$55 per night. Prices and availability subject to change. Additional terms may apply. Madrid is an enthralling city that pulsates with sheer energy and passion. Is it the long history, the vibrant culture, the unique food and fashion? Likely it's a mix of all of those and more. 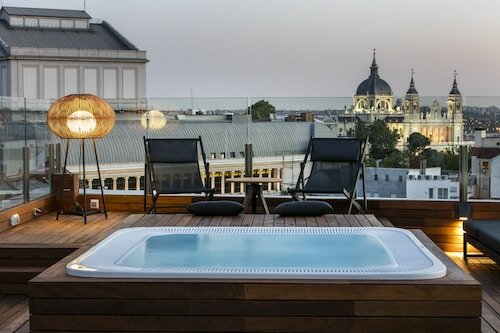 Search for a hotel in Madrid that sets you smack dab in the middle of it all and see for yourself everything that the city has to offer. 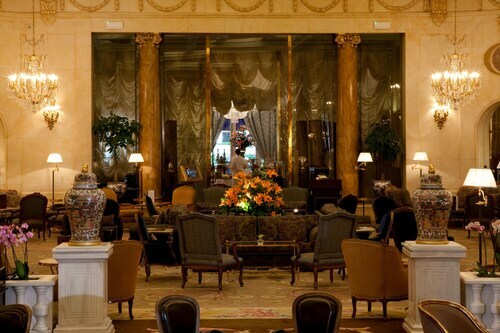 You can also check out romantic hotels in Madrid to set the ambiance right when you're traveling with your partner. Start your journey of discovery in Puerta del Sol, the cultural center of this vibrant city. 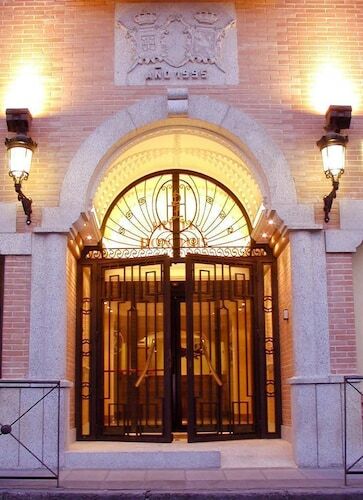 Situated right at the heart of Madrid, this area also contains numerous renowned landmarks like the Statue of King Charles III, the Tio Pepe lighted sign, and the old Post Office, which serves as the office of the President of Madrid. A short walk will take you to the historic square of Plaza Mayor and Mercado San Miguel, the enormous food market that is the best place to get lunch, offering thousands of tapas. The Prado National Museum is a must-visit for any art enthusiast, featuring an extensive collection of European art. Other museums within walking distance include the Thyssen-Bornemisza, Naval Museum, National Archaeological Museum of Spain, and The Queen Sofia Museum. There are more than enough fine restaurants with full menus to keep you eating fantastic meals the whole time you are here. Well-known places like offer culinary delights that are popular amongst tourists and locals alike. If you are staying in one of the hotels near Casa de Campo, the Mercado San Anton is the culinary scene to visit with its various food vendors offering everything from regional treats, quality foodstuffs, to fresh produce. 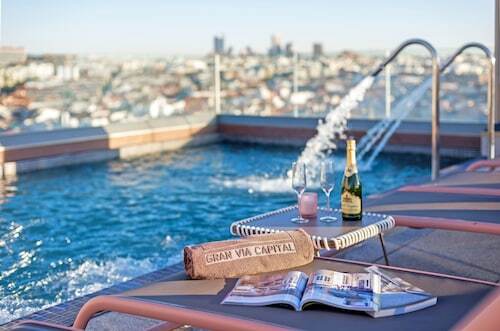 Ready to reserve your accommodation in this amazing city? 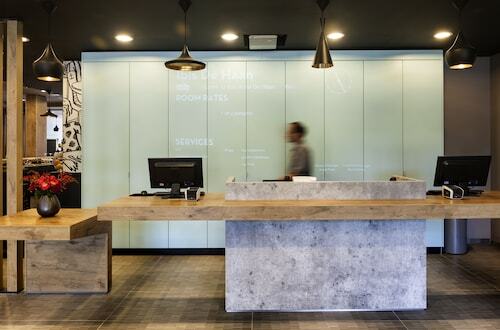 Travelocity can help you find cheap hotels in Madrid that allow more flexibility in your travel budget, or the very best Madrid hotels available if you want to stay in the lap of luxury. The room accommodations were comfortable and relaxing. The staff met and exceeded our explanations. The location was convenient per our needs. Great place to stay in Madrid. 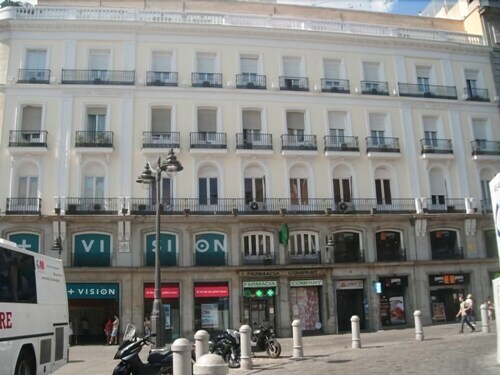 Centrally located- a short walk to the Royal Palace, el Prado Museum, puerta del sol and shops. There is a lot of construction going on around that area, but you can hardly hear the noise with the window closed. My son and I stayed at a jr suit. It was very spacious, clean and wit a spacious bathroom as well. The whole personnel is friendly and helpful. Breakfast was very good. My son loved the pastries and hams. My favorite was the coffee! Highly recommend. 7 days ago by A verified traveller from Brunswick, Maine. It was a nice place to stay, the personal very friendly.